We've done a music sensory bin before and it was a huge success. However, after getting a Safari Ltd. Musical Instruments TOOB, I knew that I had to make a new music sensory bin, one that focused specifically on instrument learning. 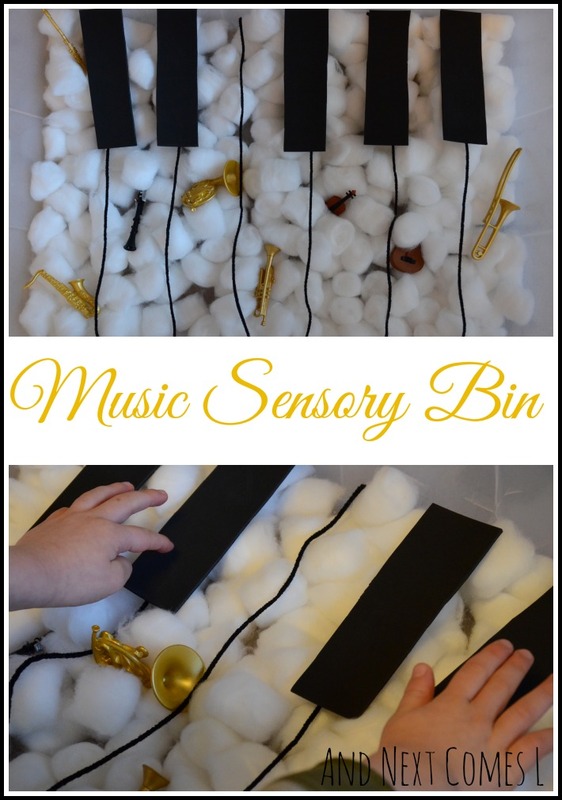 So using the piano keyboard as my inspiration, I put together this really simple music sensory bin for the boys. This post contains affiliate links for your convenience. The Musical Instruments TOOB was provided to me by Safari Ltd.. All opinions expressed are my own and not influenced by the free product. The base for this sensory bin is cotton balls. I then cut out five rectangles from black craft foam to make the black keys of the piano. To mark out the white keys of the piano, I used black yarn. I then scattered the musical instruments TOOB throughout the cotton balls. Alongside the sensory bin, I set out some plastic cups, magnifying glasses, and measuring spoons. When the boys examined this sensory bin, they were both excited to see that it looked like a piano. J exclaimed, "Oooh, a piano!" He then leaned in and started playing a song using the black keys. J then spent some time looking at the different instruments from the musical instruments TOOB, including the trumpet. Then it was time to play the "tuba" as the boys like to call the French Horn. J had the right idea. K, on other hand, liked to play the French horn backwards and hands-free. Now that is talent! A little while later, J dumped out the contents of the sensory bin onto the floor so that he could play with the cotton balls. He loved filling up a plastic cup with the cotton balls to make a bath. I guess the instruments needed a bath! What a creative sensory bin! This toob was PERFECT for your family! Thanks, Devany! It really is the perfect TOOB for us! I wish I had cool things like this to play with when I was little. Ha! I totally know what you mean! Love this! Pinning it on a couple of my pintererst boards! LOL love the hands-free backwards horn playing! Hahaha! Yeah, K is quite the character! He's got that hands-free backwards ability mastered. Why not just let them play on a real piano?,, or key board, that you can buy at a garage sale, really cheap!!!!!!!!!!!!!! Well, if you are familiar with my blog at all (which you clearly did not take the time to do), then you'll know that I am a piano teacher. My boys have access to two pianos and a keyboard at all times and are allowed to play on them anytime that they want. And pianos are rarely "cheap" and not necessarily an option for most families. Besides, this activity was meant to be an introduction to different instruments and what they look like.